Sub-Tropical NSW:The Pacific Higway is a popular route to explore all along the east coast of Australia, yet venturing off this main tourist route has its rewards. This is particularly true of the North East coast in NSW. Long beaches, some stretching for kilometers, world class surfing, lush river systems and stunning national parks with World Heritage listing, make the region a great place to explore before either venturing north to Brisbane or south to Sydney. Cape Byron, Australia’s most easterly point is also a famous surf spot. Since it also has many protected beaches and inlets, it has become a favourite stop off point for those doing the NSW east coast beach trail from Sydney to Brisbane, even in winter. More About beautiful Byron Bay: Byron Bay NSW. Casino, NSW, situated in the beautiful Richmond Valley, has heritage, places to visit and more. Lennox Head, known for its surf, is actually a a National Surfing Reserve. Here you can find Seven Mile Beach and stunning National Parks and reserves, on the coast and inland. Nearby is Ballina, also on the coast at the mouth of the Richmond River, an idyllic spot to enjoy life when on holiday. The central inland position of Lismore is near the World Heritage Listed rainforests of Gondwana and the National Parks of Wollumbin (Mt Warning) Border Ranges and Nightcap. Inland from the coast is Murwillumbah, practically surrounded by rainforest National Parks. Tweed Heads is an enjoyable day trip from Brisbane, on the border of Queensland and New South Wales. Great for fishing and surfing, it also has a very active nightlife. Tweed Valley to the west has the World Heritage Mt Warning National Park, an ancient caldera, with the scenic rainforests of the Wollumbin National Park at the base. On the lower Clarence River and on the coast of New South Wales is the beautiful coastal town of Yamba. A paradise for anglers and other fishermen, the beaches here are charming while Angourie beach is well known to surfers. Restaurants here are both cosmopolitan and great for seafood, especially the river oysters. Explore the Clarence River with a boat cruise, there are chances to go deep sea fishing or rent your own boat, or stay aboard a houseboat for a few days or week. Bounded by World Heritage National Parks to the east and west means this region is great for surfing, swimming, camping, hiking and trekking. You can find boating, watersports and river cruises on the Richmond and Clarence Rivers. 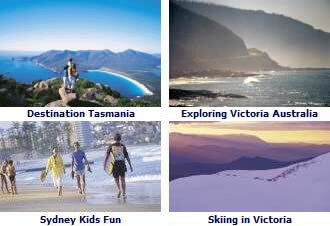 Ecotours and bus tours exploring the North NSW coastal regions include whale and dolphin watching. Houseboats in Grafton and in other parts of the North East Coast region. There are camping grounds, caravan parks, hostels, motels as well as classic country pubs to stay at. There are also many guesthouses, Bed and Breakfasts, as well as luxurious resorts and hotels for those looking for modern comfort. View Accommodation in NSW Australia. Find Byron Bay Hotel and Travel Packages Byron Bay NSW Northern Rivers Hotels. Shows Byron Bay Weather and for the surrounding region Byron Bay Weather Northern Rivers Coast NSW. 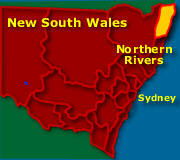 Map of the Northern Rivers NSW North East coast tourism region of New South Wales. Shows National Parks, towns including Tweed Heads, Byron Bay, Grafton, Casino, Lismore, Ballina and Kyogle. See map Northern Rivers Map NSW. Grafton, a historical city on the Pacific Highway on the North Coast of NSW, sits on the Clarence River, giving it a nice country town ambience with big graceful trees and jacaranda trees that flower gloriously in late October to early November. 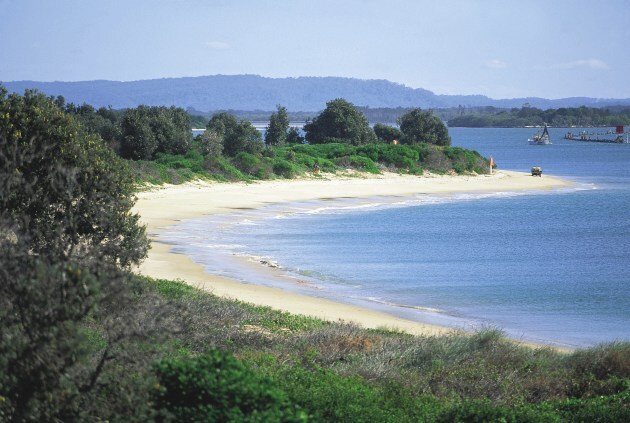 To the west are the Nymboida, Gilbraltar Range and Washpool National Parks, while to the east is Yuraygir, the longest undeveloped chunk of New South Wales coast. Further south is Coffs Harbour with its famous Big Banana, or while here go dolphin and whale watching in the Great Lakes area. Visit the nearby World Heritage Listed rainforests.